Populus deltoides is a large tree growing to 20–40 m (65–130 ft) tall and with a trunk up to 1.8 m (5 ft 11 in) diameter, one of the largest North American hardwood trees. The bark is silvery-white, smooth or lightly fissured when young, becoming dark gray and deeply fissured on old trees. The twigs are grayish-yellow and stout, with large triangular leaf scars. The winter buds are slender, pointed, 1–2 centimetres (1⁄2–3⁄4 in) long, yellowish brown, and resinous. It is one of the fastest growing trees in North America. In Mississippi River bottoms, height growth of 10–15 feet (3–5 m) per year for a few years have been seen. Sustained height growth of 5-foot (1.5-meter) height growth and 1-inch (2.5-centimeter) diameter growth per year for 25 years is common. Populus deltoides subsp. 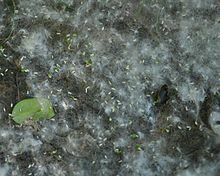 deltoides, eastern cottonwood is found in southeastern Canada (the south of Ontario and Quebec) and the eastern United States (throughout, west to North Dakota to Texas). P. d. monilifera (Aiton) Eckenw., the plains cottonwood (syn. P. deltoides var. occidentalis Rydb. ; P. sargentii Dode) ranges from southcentral Canada (southern Alberta, Saskatchewan, and Manitoba) to the central United States and south to northern New Mexico and Texas. The leaves serve as food for caterpillars of various Lepidoptera ( List of Lepidoptera that feed on poplars). Eastern cottonwoods typically live 70 to 100 years, but they have the potential to live 200 to 400 years if they have a good growing environment. The Balmville Tree (cut in 2015) was the oldest eastern cottonwood in the United States. The largest recorded cottonwood tree in the world is the Frimley Park tree located in Hastings, New Zealand and measures 138 ft (42 m) tall, 111 ft (34 m) wide and 33.4 ft (10.2 m) in girth. This cottonwood was planted in the 1870s. 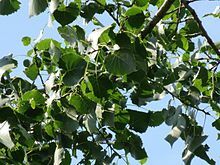 ^ "Populus deltoides". Natural Resources Conservation Service PLANTS Database. USDA. Retrieved 31 January 2016. ^ a b c "Populus deltoides". Germplasm Resources Information Network (GRIN). Agricultural Research Service (ARS), United States Department of Agriculture (USDA). ^ a b Van Haverbeke, David F. (1990). "Populus deltoides". In Burns, Russell M.; Honkala, Barbara H. (eds.). Hardwoods. Silvics of North America. Washington, D.C.: United States Forest Service (USFS), United States Department of Agriculture (USDA). 2 – via Southern Research Station (www.srs.fs.fed.us). ^ Eckenwalder, J.E. (1977). "North American cottonwoods (Populus, Salicaceae) of sections Abaso and Aigeiros". Journal of the Arnold Arboretum. 58 (3): 193–208. ^ American Forests (2013). "Eastern Cottonwood (Populus deltoides ssp. deltoides)". Retrieved July 14, 2016. ^ American Forests (2012). "Plains Cottonwood (Populus deltoides ssp. monilifera)". Retrieved July 14, 2016. ^ American Forests (2012). "Rio grande Cottonwood (Populus deltoides ssp. wislizeni)". Retrieved July 14, 2016. ^ "Tree Information". The Zealand Tree Register. Retrieved 18 April 2018.